For almost every design requirementThe system consists of three components offering flexible combinations: the lever handle, rose/backplate and square spindle. Fire Rated to BS EN 1634-1 and BS EN 179 CompliantOGRO sets are suitable for use on fire rated doors. Only compliant levers should be used with DORMA emergency exit devices and locks that are certified to BS EN 179. With springingAll OGRO models are equipped with four springs to reliably return the handle to horizontal. OGRO handle sets for timber doors are supplied as standard with springing on one side of the door. Narrow stile sets feature springing on both sides. If required, alternative patterns may be provided. All return springs non-handed. 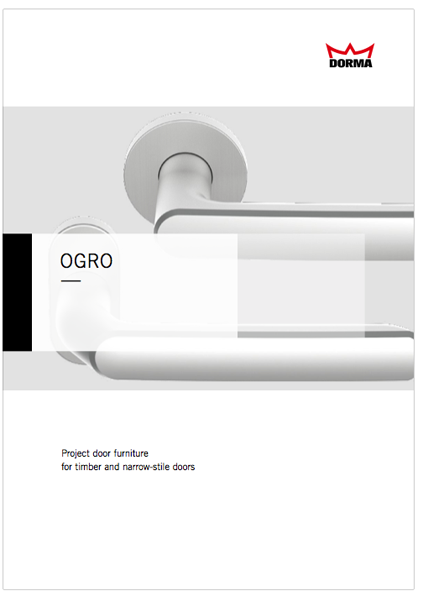 Available in aluminum or stainless steelIrrespective of which material you choose, with DORMA OGRO you can be sure of getting door furniture of true contemporary elegance. The variety and quality of the surface finishes provided are in keeping with DORMA’s reputation as a stickler for high standards. The aluminum fittings are colour-anodized in accordance with our own formulations, producing a thick and even oxide layer for effective protection against weathering and wear. OGRO fittings in aluminum are available in F1 Silver/natural (mill), F2 Champagne, F3 Brass, F4 Bronze, F5 Bark bronze, RAL powder-coated, and anodized in a mock matt stainless steel finish. The stainless steel fittings themselves are available in a matt satin finish, bright-polished or PVD-coated.